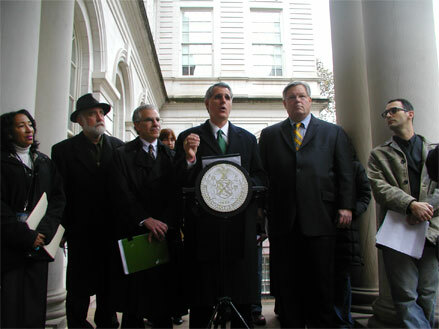 New York State Senator Thomas K. Duane and New York City Council Environmental Protection Committee Chair Jim Gennaro today demanded the New York State Department of Environmental Conservation (DEC) hold scoping hearings on the impending drilling of the Marcellus Shale in New York City. Nine million residents who depend on clean and safe drinking water could be threatened by the toxic chemicals used in the drilling process. In recent years, the gas industry has initiated a land rush in the Catskills and the Delaware River Valley to secure portions of the Marcellus Shale formation  a potential source of natural gas. The gas would largely be accessible only through the use of the newly economically feasible method of Hydraulic Fracturing, or "fracking." This requires toxic compounds to be added to enormous quantities of water which are pumped at high pressure into horizontal wells to fracture gas-bearing rock formations. The possibility that these chemicals could seep into New York City's watershed is alarming. On November 21, 2008, Senator Duane and Councilmember Gennaro wrote a letter to DEC Commissioner Alexander B. Grannis supporting the request made by the Natural Resources Defense Council, Sierra Club Atlantic Chapter, Environmental Advocates of New York, and many other environmental advocacy organizations that DEC hold a scoping hearing in the City and another in the City's watershed, to enable those whose water is at risk to participate in the discussion. In accordance with State Environmental Quality Review Act, the DEC, which regulates oil and gas mining, has scheduled six scoping hearings so that residents, environmental advocates and elected officials can express concerns and shape the parameters of the Supplemental Generic Environmental Impact Statement mandated by Governor Paterson. Inexplicably, no such hearing is scheduled in New York City. Senator Duane and Councilmember Gennaro's letter also expresses support for legislation ("A11527") that has been introduced in the New York State Assembly, which would establish a two-year moratorium on the issuance of permits for the drilling of new wells. "The fact is that nobody knows the environmental impact that this controversial drilling will bring to the Marcellus region," Senate Duane said. "We want to ensure that DEC thoroughly considers any and all threats to our precious natural resources and allows New York City residents, advocates and elected officials to testify at a scoping hearing. Anything less is unacceptable." "It's clear that natural gas exploration in the New York City watershed will contaminate the drinking water of over nine million people," said Councilman Gennaro, who chaired a City Council hearing on this topic on Sept. 10. "This is an activity that should not occur, and the members of the public who'd be most affected by it should have the opportunity to let their voices be heard about it."